I spotted a vide of this posted on Assistive Communication site just a few hours ago, so played the video on my iPad so I could get some screenshots of this particular part. The app is called Touch Chat Suite by the Saltillo Corporation. They make a communication aid which was based on a windows PDA, they have now seen the light. so to speak.. and relaised the potential of the iPad/iPhone and the app store. Basically in the Touch chat suite you will be able to download the appropriate program for your needs and for the first time, here is a company that has one specifically designed for adults who are already fully literate but have lost speech in later life. This app will be called iEssence and I think is based on the new Essence communication aid by Prentke Romich who are famous for their Minspeak systems. The Essence however, is aimed at adults who have lost speech but not their ability to read. The screenshots only show it on the iPhone at the moment, but I’m expecting it will also work on the iPad and therefor some of the buttons will be bigger (in x2 mode) or there will be more buttons available on-screen in the iPad version. This app is due late November according to the Assistive Technology site, I’m not sure if iEssence will be part of the initial package available or an additional pack that you download, or won’t be available until a later date. However it does look promising for adults with acquired speech loss and may work out cheaper as you wouldn’t need to have on all the symbol based stuff too that you don’t need. There is no information on the pricing as yet. 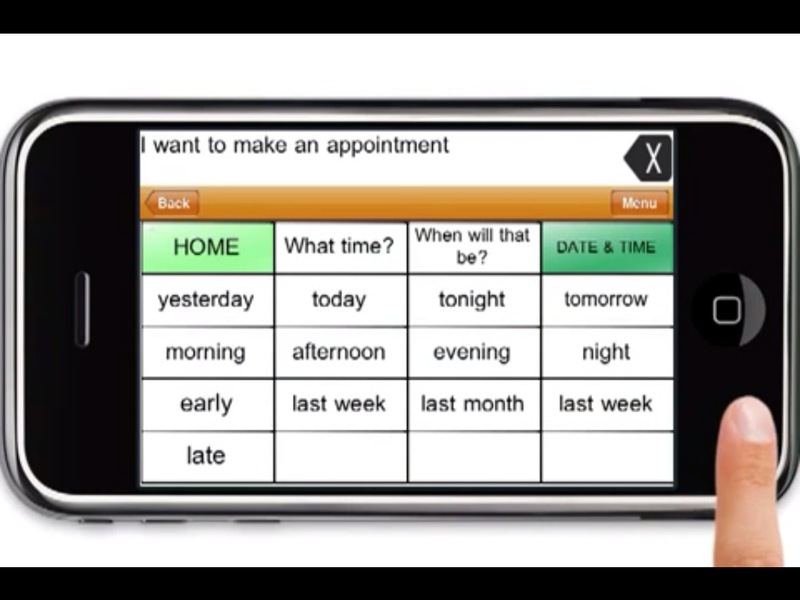 Info about iEssence starts at around 08.48 (first screensot of it shown) the Touchchat suite also features wordpower. 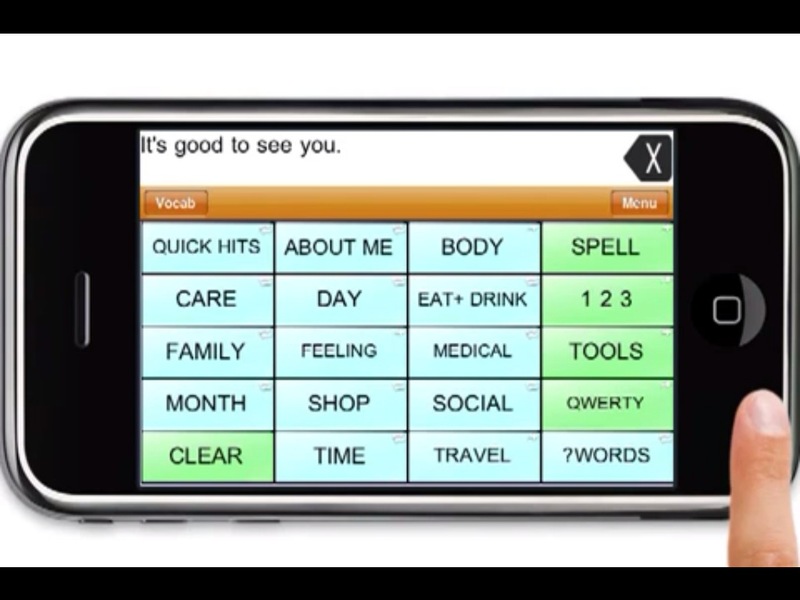 wordpower with phrases and a simpler Touchchat interface for younger children – also featured in this video. 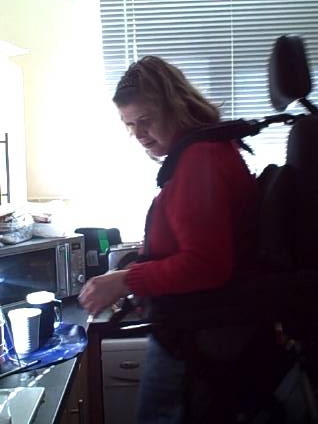 Today I tried the Genie Sit-to-Stand powerchair. At £5,900 for fully electric sit-to-stand it is much cheaper than the most which are usually over the £10,000 price mark starting with Otto Bock RWD stander at £12,000. I have seen the Invacare Dragon Vertic in pics and believe that is around £7,000 and is a RWD. I haven’t tried that one so I’m not sure if it would manage to manouvre between the 90 degree angle between bedroom and lounge doors. The Genie managed this easily been FWD. I was worried after struggling to control the Dragon that I would struggle with the Genie outdoors but I did alot better and found it much easier to steer. The joystick had like a recessed T-bar and which you could rest the palm of your hand to steer it. You can see what I mean in this picture when I was testing the recline feature. This allows you to just rest your hand on it and use gross motor arm movements to steer the chair instead of needing fine finger control. Here’s me going to stand, the guy seems to have been holding the Flip camcorder sideways, maybe to get full length of chair in as it rose. Here’s me making a cuppa… I seem to have accidentally deleted the part where I went for milk as the rep had filmed the parts separately I’ve also lost the clip of it going back down! It is a nice chair the base is nice and neat, not too bulky, it doesn’t stick out miles behind you. The seat is the most bulky part. The knee brace is quite bulky and sticks out alot when sitting but as you stand you can see why as the sides of the brace slide around each knee as you go up to standing and fully supports each knee. 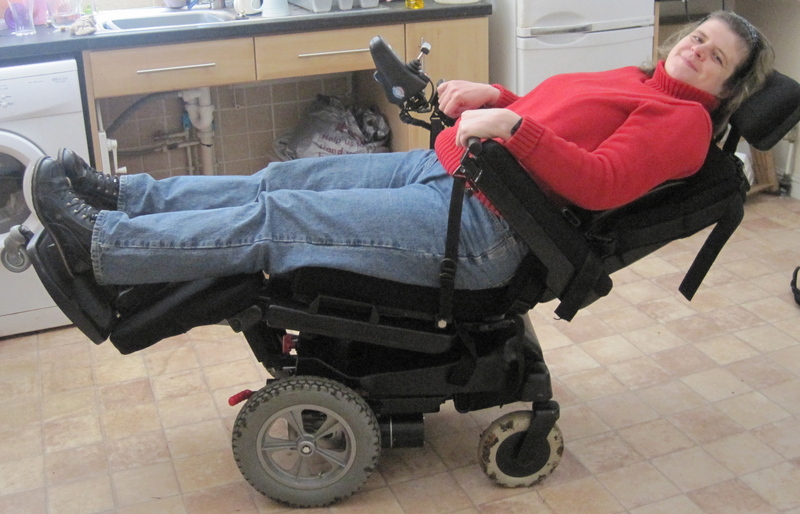 There is also harnessing for the upper body which can be loosened a little to allow you more reach whilst you still get full support from the chair and can’t fall out or balance over. The controller is easy to use, you only really need the one button to switch from drive to seat control and then the joystick to move between the small illustrations which are on the controller with a small LED light to show you which one you have selected for recline, rise seat (sitting – to just give you bit more height) stand, etc. It goes up very slowly, comes down a bit quicker than it goes up but its not at all scary and felt safe. For driving outdoors it has different settings for different levels of control, and these control how fast the rear castors spin too, on program 3 I managed easily to keep it in a straight line up the road and it wasn’t scary going over speed bumps and the steep kerbs. Programs 4 and 5 make the back castors turn alot easier and faster which is good over grass, it was also handy for that steep kerb where you have to start turning half way up or you end up in the hedge! Though even on program 5 I managed to keep it in a straighter line than I had the Dragon, although when my arm twitched the the chair did react more. I think I’d probably use the lower programs where needed to keep it on a steady path and the higher ones for turning on grass cos its so much fun spinning in circles on FWD chairs!! As it can turn on the spot within the dimensions of the chair it is much easier to negotiate around my bungalow and is shorter than the vibe with the footrest removed. I wasn’t sure I like the extra castor sticking out of front of the footplate (its needed when chair is in stand mode) but it does give stability on steeper kerbs if lowered and used like an anti-tip. You just need to higher the seat to lift it off the ground for going over grass. 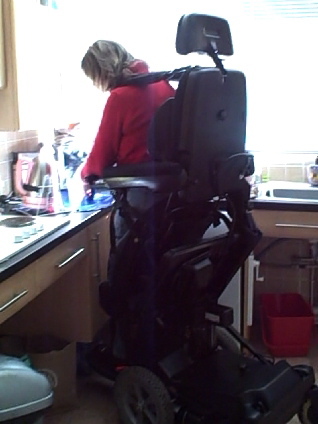 standing... without hanging onto worktops or rollator!! Even with footrests on in that same position I can get directly from bedroom into lounge which is impossible with Vibe (RWD) even WITH the footplates off. 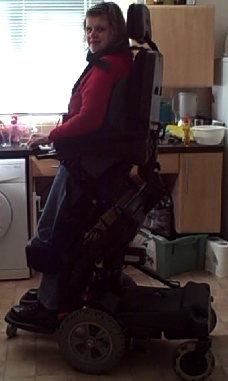 It can drive in standing mode so nice to drive around the house stood up! Due to the threshold over the back door I would have to lower the seat first so if for example I wanted to stand to hang washing out, I’d have to go over the threshold first then raise to standing and sit back down again before coming in, unless I unlocked back gate and went out front door straight down to rotary dryer. Under the UK laws it can’t be classed as a pavement vehicle if it goes over 4mph and you then need a tax disc for it as it puts it into class 3 category which used to only apply to the big 8mph scooters, seems it applies to chairs too now as some can go as fast as scooters and tend to be used in more pedestrian areas. I think even the Balders chair at £16,000 only has a top speed of 4mph. (one’s built for UK). 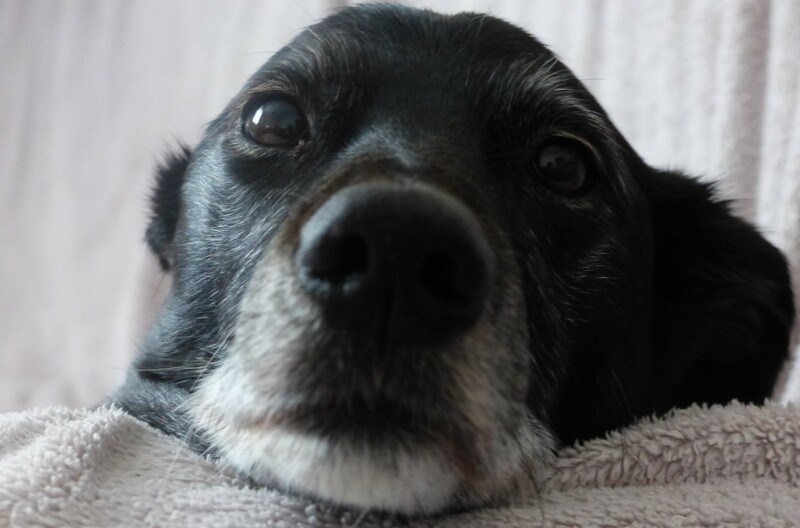 I think this is something I can live with as was planning to keep scooter for most of Inca’s walks around villages and over playing fields, there’s only that little park I use the chair in when I’m too tired to go far, weather is bad, or back up when scooter is away for repairs. I remember years back when used to get up into town in the old Enigma chair that it didn’t do bad when it was brand new and working properly. Overall I was very impressed with it, and now waiting for a full Quotation to send to PCT (Primary Care Trust) to see if I can get funding for it or vouchers instead of the standard issue electric indoor chair from NHS. I’m hoping I’m more likely to get it with it been an ‘indoor chair’ and been considerably cheaper than most brand new chairs (even without standing function). Keep your fingers crossed for me and watch this space!! ..